I have been hunting the Springwater land for 25 years. I have taken many deer off the property, some good bucks but nothing like this one. Over the last few years with the invention of the trail camera, it has given me the extra drive to pursue the exceptional bucks in the area. I have been strategically locating three trail cameras all year long. 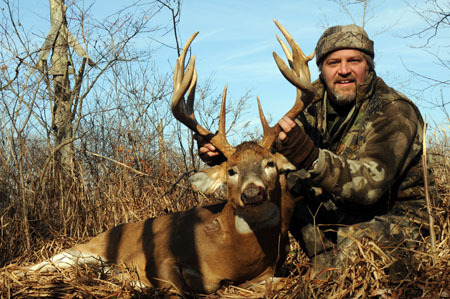 Two years ago in 2010 I had this 12-point buck on camera, he was pretty nice then, but I also had a 10-point with a fly hole on camera as well, very unique. I passed many deer that season trying to get that 12-point, but finally took a wide 8 that was pretty good. Last year, I tried for that buck with the fly hole and was unsuccessful on him or any other bucks. I just wanted the "fly hole" buck. By the end of season, he was nowhere to be found, not even on my cameras. Well this spring we heard that someone had found him dead during the end of season. When he was found, he was warm and had not been shot. His joints were covered in tumors as was his face. He turned out to be 6-1/2 years old. It finally gave me closure on him. So back to the 12 I got this year. I had some great pictures of him this summer and fall. Most were of him at night. It was great that opening day was moved up to October 1st, so I had more time to chase this guy. Well, I hunted hard for seven weekends before I had a shot at him. It was a tough frustrating seven weeks. Nothing seemed to be going in my favor, I jumped deer going to my stands more times than I care to remember, When I was in the stands, it seemed like they all saw me or winded me. I did have multiple opportunities at does and small bucks, but I was focused on that 12 point. The Last Sunday morning of bow season wasn't any different than any of my days in the field. I decided to hunt a stand close to camp, just as I got close to my stand, I jumped a deer. He snorted like nothing I'd heard before, I think every deer in Livingston County could hear him. Frustrated again, I decided to go to a stand that I didn’t have much confidence in, the sun was coming up, so I had no choice. After 45 minutes in the stand, I saw a large buck coming through the woods right to me. The wind was perfectly in my favor. He walked in to a lane about 80 yards out then stopped and looked around. I thought he was going to bolt and leave the area, but he continued to walk in. When I saw him the first time I knew he was a shooter. I wasn’t sure if he was the big 12-point I had on camera, but I was anxious to take a shot at a nice buck. I never focused on his rack, but just concentrated on getting a good shot at him. He walked in and at 40 yards, stopped broad side, and started to feed. Forty yards is at my limit, but I had practiced all summer at this range. I took the shot and it was perfect elevation wise, but a little too far forward. I could hear the crack of the arrow hitting his shoulder blade. He spun around and I could see that arrow sticking out. Much more of it then I cared to see. He took off like a bat out of hell. I knew it was a bad shot. I got down and followed his tracks to the neighbors property line. There was no blood and all I found was my arrow nock. I called the neighbor to ask permission to look for the buck on his property, he granted me permission and wished me luck. Well, no luck at all. So, I finally gave up looking and decided to call it quits for the weekend. 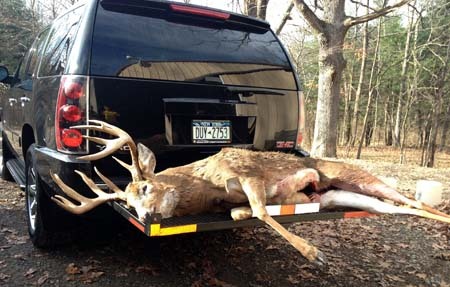 I still wasn't sure if he was the 12-point I was chasing, all I knew was that his beams were pretty heavy. The following Friday afternoon I was back in a stand and trying to fill my bow tag. Again my luck was bad. I heard some noise behind me, and ever so slowly I tried to turn and take a look and again, the deer took off and all I saw was a flag going thru the brush. That eve I couldn't decide which stand to hunt for the opening morning of gun season. Nothing seemed to have gone in my favor this season. My hunting partner pushed me to hunt my "tried and true" hot stand. I was in that stand with plenty of time. The sun came up and it was quiet, no deer. The conditions were perfect. The leaves were so dry that if anything was walking around, I could hear them as if they were walking on potato chips. A little after 8 a.m. I heard something behind me in the thick stuff. It was coming toward me and was going to come into one of my shooting lanes. I was ready, gun up and shouldered. First I could see a body, then it's muzzle, and then I could see his rack. He was a great shooter. That’s all I needed to know and as soon as he stepped out, I fired. He dropped right in his tracks. He was only 20 yards away and I could see he was the 12-point I had been chasing, my "second chance" buck. I could not believe that I had a second opportunity at him. I started to laugh and thought, "How is this possible?" I finally got down and took a look at him, he had an arrow wound in his shoulder and that confirmed he was the buck I had shot the weekend before. We ended up bringing him to camp and weighed him before we gutted him at 223 lbs. I had him aged and he turned out to be 5-1/2 years old. I green scored him as best I could and came up with 164-3/8 without any deductions.